Hobby, home business or full gallery its all the way with Diyframing. Why bother to do your own framing? Sorts out the pile of artwork, photography and prints, "Which would look good in the hall." An exciting and interesting skill to learn and who knows where it will lead? Everyone doing picture framing will fit roughly into one of 3 categories. The level you are at will inevitably influence the choices you make about how you want to frame. Every framer needs supplies and materials. The range is the same for all. Clearly, being able to buy and store in bulk means you attract discounts. At DIYframing we have supply solutions to match each group's needs. We can send mount board in small quantities or by the carton. Moulding lengths can be ordered by the cm - even ready mitred from the chop service. We can arrange hugely discounted bulk deliveries or set you up with an account at Arqadia, our main moulding supplier. The best news here is that the quality of product is the same whatever level you frame at. "Just because you do small amounts of framing, shouldn't mean you have to compromise on quality." Duncan McDonald, CEO of DIYframing is also keen to point out, "At the same time, we want to let people develop with products they know and trust. This is why we continue the links with Britannia Mountboard and Arqadia mouldings for those starting to work in the professional framing market." Decisions have to be made from the beginning. Now you have access to great quality framing materials, what tools do you need? Two factors will have a bearing on your choice: space and volume of work. When you frame any picture, there are 6 stages you will work through. For each step you will need tools to give you the quality finish you are after. None of the tools takes up huge amounts of space. The simplest range can be put away after use, making it possible to work from a single table top. 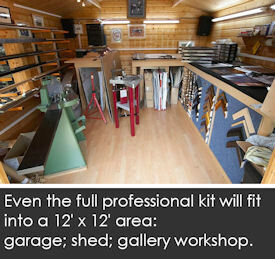 Even the full professional kit will fit into a 12' x 12' area: garage; shed; gallery workshop. A whole range of mount cutting systems offer top quality mount cuts: for more click mount cutting systems. Always go for the most advanced you can afford as later upgrades become expensive. You will always end up doing more framing than you anticipated. The main culprits are called friends and family - once the word is out they will all be giving you a call! The bit we all think of as framing is the cutting and joining of the moulding. Whilst space and quantity are still important factors in making decisions about the tools you are after, also think about the work size. Cutting mouldings for most hobbyists (and some home businesses) will be done using a good mitre saw followed by a pass through the mitre trimmer for perfect mitres. The foot operated chopper / mitre guillotine does come into its own when you want to work faster: more the province of home business and gallery. With joining, a great starting point is the studio joiner, progressing though the pro joiner (small business) and into the underpinners (M3 and Alfa). If you need to work with larger dimensions you need to look carefully at the underpinners as they leave your hands free to grip without needing to make adjustments in order to position v-nails - they are fired in off a cartridge using a pedal. After that come the finishing processes - putting the frame together involves roughly the same type of kit for all picture framing. One exception is the introduction of a sheet materials cutter: the Onyx 90. It will cope with glass, backing boards and mountboard panels, just by selecting the right cutting head for each job. Every business should have one and because they are wall mounted they take up no real space. "We talk about different standards of framing: hobby; small business; gallery standard. Actually, for us, we recognise you all want the same thing." Duncan knows his market, "You want products and tools to give best quality at affordable prices. What DIYframing does so well is research the marketplace and offer you that whole range, at prices to suit your budget. We then keep that range on offer - as your needs grow you can upgrade with confidence." Look through our on-line store, check out the huge amount of information on our website, find out about our training programme - here's everything you need for framing in one place. When we tell people, starting off in picture framing, we are with you all the way, it is no idle boast.